Desirable Monterey plan located on the #1 hole at The Golf Club at La Quinta with panoramic mountain views. This single-level residence, with close proximity to the Santa Rosa Clubhouse, includes 1,667sqft. of interior space, 2 Bd/2 Ba, den/office/3rd bedroom, tile flooring throughout (set diagonally) and crown molding. Great room has tile-surround gas log fireplace, TV/media niche and a bay of windows to the outdoors. Entertaining kitchen boasts upgraded stainless steel appliances, granite counters, custom tile backsplash, prep island, pantry and built-in microwave. Separate guest bedroom w/adjacent bath is convenient and private. Master retreat has slider to rear yard and en suite bath including dual vanity, walk-in closet and large stand alone shower w/upgraded glass door/panel. 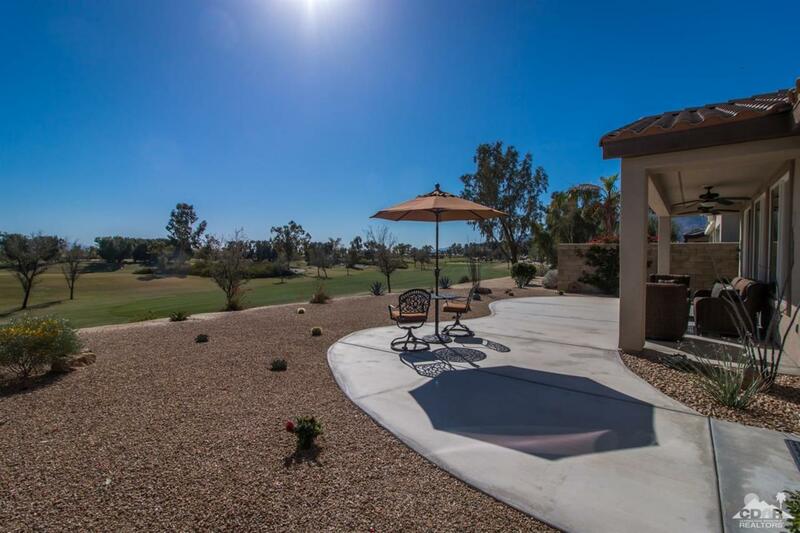 Enjoy the golf course views from the rear covered patio with low maintenance desert landscaping, free form concrete decking from an elevated lot. Just a minute ride in your golf cart and you're at Bistro 60.